People with obstructive sleep apnea (OSA) continued to be at higher risk of developing gout beyond the first year after OSA diagnosis, reports a new study published in the journal Arthritis & Rheumatology. Edward Roddy and his associates conducted a retrospective cohort study to investigate whether people with OSA are more likely to develop gout than those without OSA in both short and long-term. “People with sleep apnoea are at an increased risk of gout in both the short and long term. Since this risk was highest in people with normal body mass index, doctors, and other health professionals should consider the possibility of gout in patients with sleep apnoea regardless of body mass index,” said Dr. Roddy. The study involved 15,879 patients with OSA and 63,296 without, with a median follow-up of 5.8 years. 9% OSA and 2.6% non‐OSA patients developed gout. Incidence rate per 1000 person‐years was 7.83 and 4.03 among those with and without OSA respectively. The risk of incident gout among OSA patients compared to those without was highest one to two years after the index date. This finding persisted among those overweight and obese. For those with normal BMI, the highest significant HR 2.02 was observed at two to five years post index date. It’s thought that intermittent oxygen deficiency due to OSA leads to overproduction of uric acid, which causes gout. “Sleep apnea is commonly treated with continuous positive airways pressure–or CPAP–therapy. Since CPAP treatment corrects low oxygen levels it might also be expected to reduce uric acid levels, which could possibly reduce the risk of developing gout or treat existing gout; however, further research is needed to investigate the effect of treatment with CPAP in people with gout,” said Dr. Blagojevic-Bucknall,co-author of the study. Obstructive sleep apnea is a potentially serious sleep disorder. It causes breathing to repeatedly stop and start during sleep. This type of apnea occurs when the throat muscles intermittently relax and block the airway during sleep. 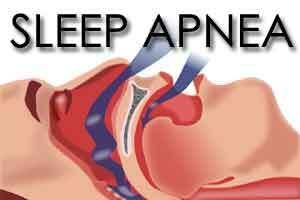 A noticeable sign of obstructive sleep apnea is snoring.